The Murray Mouth — where the River Murray completes its 2,530 km journey and flows into the Great Australian Bight — was celebrated on June 8 2016 as part of World Oceans Day, a day that aims to encourage the global population to protect and conserve the world’s oceans. When the 140,000 ha area is healthy, it maintains a rich habitat for fish and waterbirds in the region, as well as provide a supply of water that can be pumped to Adelaide and the south-eastern corner of South Australia. But it can become unhealthy when the Mouth naturally begins to close due to a build-up of sand deposits. It is important the Mouth remains open to maintain connectivity between the river, the Coorong and the Southern Ocean, to discharge salt and other nutrients out to sea, and to maintain healthy ecosystems in the Coorong. 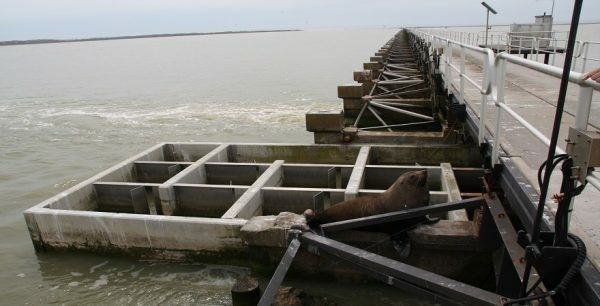 Seal at a lock near the Murray Mouth. Photo by Emma Hampton. 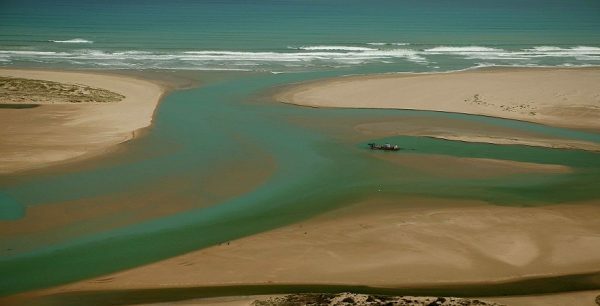 The Murray Mouth is known as a dynamic system influenced by the flow of River Murray water through barrages and tidal movement from the Southern Ocean. This 130 km long area is a Living Murray icon site and Ramsar site of international importance for migratory waterbirds. When the barrages open, fresh water flows from the Lower Lakes and mixes with the saltier water of the Coorong, creating a healthy habitat rich in food and shelter. An open Mouth allows varying tides in the Coorong to maintain mudflat habitat for waders and provides cool, oxygenated flows to the Coorong. It also provides appropriate salinity and water levels for healthy populations of Ruppia (a key aquatic plant), fish breeding, water birds and macroinvertebrates. An open Mouth is strongly connected to the cultural health of the Ngarrindjeri people as well. When the weather is dry though, and flows are low, salt accumulates on floodplains, and in wetlands and rivers across the Murray–Darling Basin. The only way to get rid of salt from the Basin is by high enough flows (or a flood) from the River Murray flowing out through the Murray Mouth. Barrages are designed and operated to ensure the lakes and lower reaches of the river remain fresh, not only for environmental reasons, but as a water supply source. However, because of dry weather, other measures need to be taken until a flood reaches the Mouth and flushes salt from upstream out to the sea. The Australian and South Australian governments are currently dredging sand out of the Murray Mouth to ensure it remains open. Dredging, which is not new to the region, is the process where sand is pumped out of the Mouth and transferred by pipeline further out to sea, to ensure the Coorong remains connected to the Southern Ocean. This process has been underway since January 2015, and will continue for at least another year, to maintain the opening and subsequently the health of the mouth. By mid-April 2016, almost 1.2 million cubic metres of sand had been dredged. This has resulted in a net reduction of sand at the Mouth of 241,000 cubic metres. In the future, under the Basin Plan, greater flows to sea will reduce the frequency of dredging. Mouth of the Murray River, South Australia. Photo MDBA.